As marketers, we try to get our hands on the most sustainable content that not only increases sales, but also gives us the competitive edge in the industry. The problem many of us face is figuring out which form of content is worth investing our time and money in that’s had the most success with other brands. If you haven’t caught on to Buzzfeed yet, the solution to your problem might’vegone undetected. Using quizzes as a part of your marketing strategy is one of the most underrated types of content that every marketer should be trying, and we’d be lying if we didn’t tell how effective they really were. It isn’t enough for us to just convince you to implement quizzes in your marketing strategy, so we’re going to show you exactly how to create an effective quiz, how to distribute it, and how to follow it with marketing automation. After following this guide, you’ll come across several brands that we’ll be highlighting to give you an idea on how they used quizzes in their marketing strategy so that you can walk away with a little more insight. There’s more to a quiz than you might actually think. Did you know that 80% of readers decide whether something’s worth checking out or not based on its title? That means we’re going to have to make a pretty good first impression. The very first step to creating a quiz would be coming up with the title for it. Once you’ve got that down, you’re going to want to figure out what type of quiz you want to make. The “Actually” Title – Believe it or not, adding the word “actually” can turn a simple question into a challenge. Compare “How much do you know about the Golden State Warriors” against “How much do you actually know about the Golden State Warriors” and you’ll see what we mean. No one likes to back down from a challenge, right? “The Which (Blank) Are You?” Title – This one’s a classic. Due to our innate inquisitive nature, sometimes we just have to know which Marvel superhero we are before we die. It’s just one of those things we have to cross off our bucket list. The “Celebrity Personality” Title – This is your typical personality quiz with the substitution of celebrities to give it that added pizazz. Because of the use of celebrities, they’re more likely to get someone’s attention sheerly through being starstruck. The Personality Quiz – We like to hear good things about ourselves, so because of the “self-serving bias,” personality quizzes work so well. This type of quiz categorizes people into personalities that compliments them based on their answers. 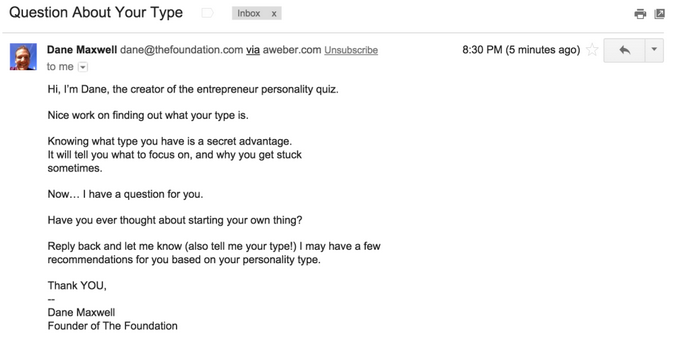 If you’re a brand that focuses on product sales, you could use a personality quiz to place individuals into categories with personalized product recommendations based on the answers they gave. The Knowledge Test – This is another commonly encountered type of quiz that you can find on social media. The knowledge test simply challenges anyone’s knowledge on a given subject. You could ask your audience how much they know about your brand, the products it offers, or any of today’s trending topics. Now that you’ve got a general idea of what kind of quiz you want to create along with a title to go with it, it’s time to bring it to life by filling it up with questions! Infuse Personality into Your Quiz – Breathe some life into your quiz by injecting your personality into it. Approach your audience as if you were talking to them in person. Make your audience feel comfortable so that they’ll be more likely to opt-in later. Use Images for Your Questions – There’s nothing wrong with having text-only questions, but don’t be afraid to use images either. Using pictures keeps things interesting and relevant, it also makes your quiz feel more like a trivia game. Keep Things to a Minimum – People these days don’t have the longest attention spans, so we’re going to want to keep things simple and sweet. Aim between 6 to 10 questions for your quiz, in general this will only take your audience about 2-3 minutes to finish. Give your audience a reason to provide you with their contact information. Offer incentives like a free eBook or an entry to a free giveaway. Standard incentives include infrequent updates about your brand or a weekly newsletter. Find what works best to encourage your audience to join your mailing list. What’s the point in asking your audience for their phone number if you aren’t going to call them? Make sure you only ask for information that your brand will use; the most basic being a first and last name, and an email address. What’s worse than handing someone your number and not getting a call back the next morning? Yeesh. It won’t always be clear to your audience that after you get their contact information, you’ll be contacting them. It’s a good rule of thumb to let your audience know that you’ll be getting in touch with them soon, so don’t be all hush-hush about your marketing strategy. Be honest with your audience. Give them a quick head’s up about what’s to come. Be Honest and Positive – Positive emotions are more likely to promote sharing, so create results that compliment your audience into sharing what they got. At the same time, be honest with your results. Don’t tell your audience that they’re something they aren’t. Use Share-Worthy Images – Just like how we used images for your questions, we’re going to want to make sure we use images for your results. This time around, you want to use some pretty interesting pictures; ones that are worth sharing. This is what’s going to attract attention when people share their results on social media. Create A Call-To-Action – Don’t let your interaction with the audience end at the results. Provide a call-to-action for your audience. It can be something as simple as a link to your website, or maybe even personalized links to product recommendations. Now it’s time to put your quiz through the ultimate test by promoting it on social media. Your major outlets for social networks would be Facebook and Twitter, but if you wanted to take it a bit further, you can also use paid advertising on Facebook to give your quiz that extra boost. Be sure to use an attractive image to represent your quiz. Make sure you have a captivating headline for your quiz. The process of promoting your quiz through Facebook via paid advertising can be a fairly lengthy operation, so to save you guys some time, we’ve truncated the whole process into a more time-friendly summary. Selecting Your Target Audience – You have your choices of selecting a target audience by location, demographics, behaviors and connections. You can even break these categories down even further. Let’s take location for example. We can narrow down location to country, state/province, city and zip code. Why would we want to do this? Maybe your brand wants to target an audience within its immediate vicinity. We don’t know. It’s up to you how you want to set the parameters for your target audience. So give it a try. Creating A Custom Audience – It sounds complicated, but it isn’t. Creating a custom audience consists of working with a list you’ve uploaded ahead of time. Facebook then generates an audience based on that list of previous customers you’ve already worked with. Here’s the fun part: following up on the leads you’ve collected with marketing automation emails. With the help of marketing automation, this may not take as much effort on your end as you might’ve thought. We’re going to follow-up on your leads the very moment people opt-in, and in the course of two weeks, we’re going to show you how to nurture these leads until you can finally convert them into paying customers. Thank Your Audience for Taking Your Quiz First – Immediately after someone opts-in, send him or her an email that telling them “Thank you for taking our quiz!” This will remind your audience that they’ve opted-in, and it’ll also help assert your brand. It’ll give people a head’s up that you’ll be getting in touch with them soon. Encourage Your Audience to Retake Your Quiz – After a couple of days, we’re going to pick up where your audience left off: their quiz results. Inform your audience about the other results they could have gotten. 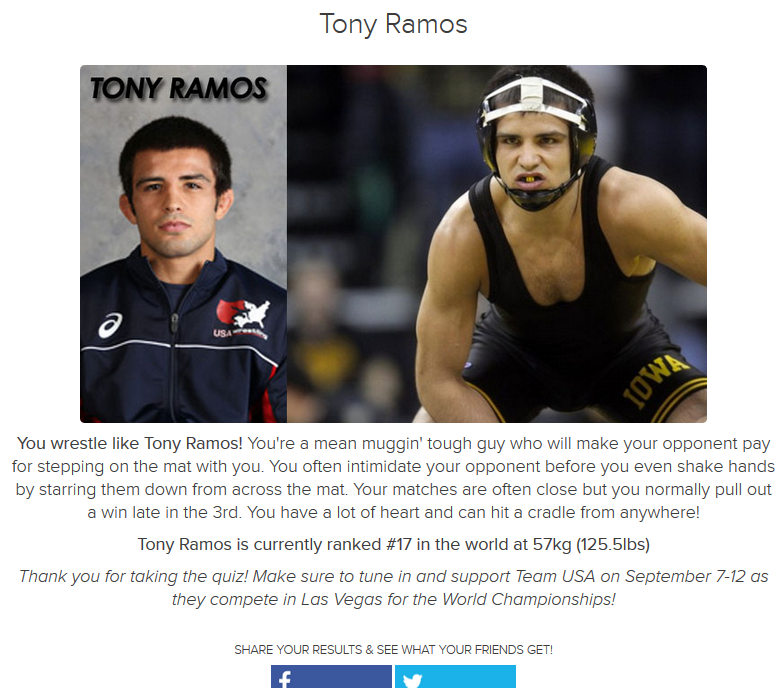 This may prompt your audience to retake your quiz, and maybe to even share their new results. This is the perfect transition from your “thank you” email to sending out different content. Build Trust with Case Studies or Testimonials – After a week, now would be a good time to build trust between you and your leads. Introduce testimonials or customer case studies to familiarize your audience with your brand and what other people think about it. This not only makes your brand look good, it lets your audience get more comfortable with who your brand is and what it stands for. Convert Your Leads into Paying Customers – After two weeks, it’s time to convert those leads. Your audience should be familiar with your brand by now. Use incentives like a webinar signup or coupons/discounts to encourage your leads to buy into your brand. The rest is up to you and your expertise in converting leads into customers. These marketing automation follow-ups did most of the work for you, so it’s your turn to close the deal. It’s time to take a quick look at several examples of brands from different industries and how they implemented quizzes in their marketing strategy. Seeing these examples should give you a solid foundation when it comes to considering the use of quizzes in your own marketing strategy. Z Gallerie is known for their commitment to providing furnishings, art and accessories to both professional and amateur interior designers alike. 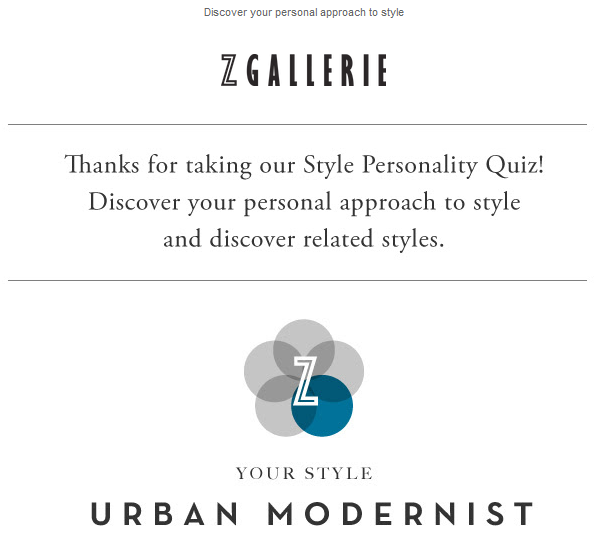 They created the quiz “What is your Z Gallerie Style Personality?” to provide a personalized experience for every potential and current customer. 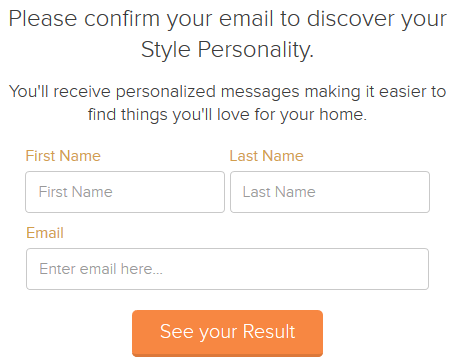 Z Gallerie used a personality quiz as a way of bringing results that offered personalized product recommendations as a part of their marketing strategy. This method brought in a massive amount of leads per day which they followed-up with marketing automation. It allowed Z Gallerie to continually recommend products tailored specifically to each person based off of their individual quiz results. Now that’s online shopping done right. Cloud Sherpas specialize in cloud advisory and technology services for the world’s leading brands. Cloud Sherpas used their quiz to gauge each individual’s level of maturity, which helped determine the more qualified leads for their marketing strategy. 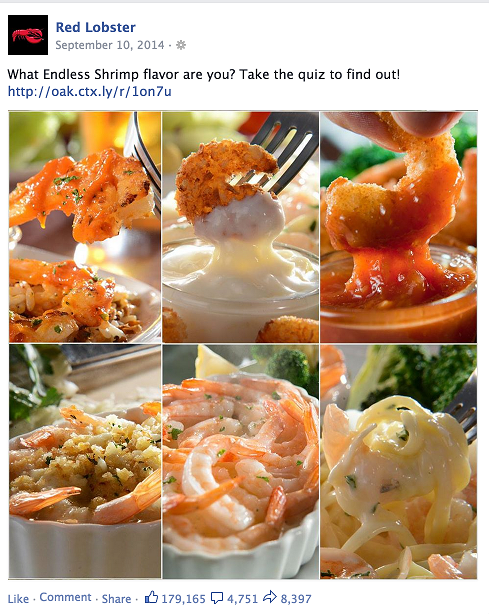 They also promoted their blog on Facebook with the quiz attached. Cloud Sherpas’ quiz brings in 3-4 qualified leads a day. Nothing like quality over quantity, am I right? The Foundation focuses on building businesses with entrepreneurs through the idea of building backwards. 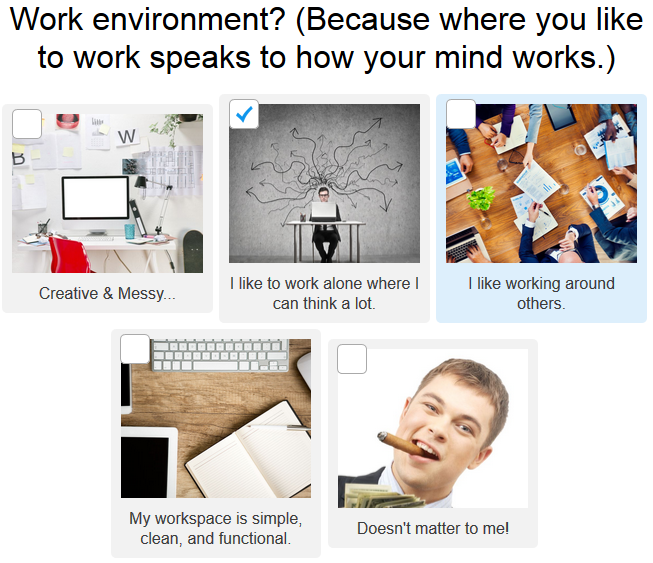 It’s an incredibly interesting concept, and with it, they created the quiz “Do You Have An Entrepreneurial Mind?” based on an existing eBook they had which covered the basic types of business owners. The Foundation used a quiz in their marketing strategy by pairing it with a Facebook ad campaign. This combination was able to cut their cost per lead from $6.00 to $3.80, and collected over 16,000 leads and millions in revenue. That’s quite the turnout if you ask us. 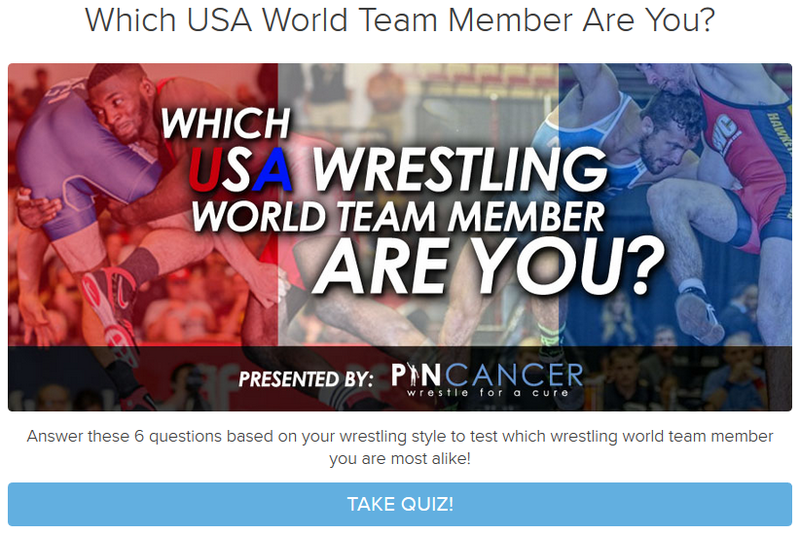 Pin Cancer’s call-to-action is the rallying of the US wrestling community to fight against, you guessed it: cancer. Their noble efforts have prompted the aid of their quiz “Which USA World Team Member Are You?” as a means of driving social traffic and raising awareness on cancer. On a site that normally sees 200 visits per day, Pin Cancer had the best day ever when their quiz went up, driving social traffic up to 6,000 in a single day and bringing in 3,800 new email subscribers. Talk about turning the tables on cancer! @PinCancer @Jakeherbert84 true! Can't match the style of a ninja! And there you have it. Who knew implementing quizzes into your marketing strategy could go a long way? We’ve just covered a lot of material, but hopefully you got a lot out of it. Just to recap, we went over the entire quiz creation process, so you should be familiar with how to create your own quiz by now. Distributing your quiz will really put it to the test, but as soon as you generate those leads, you know exactly how to nurture them until conversion. From all of the examples we’ve looked at today, you should be able to walk away with a little hop to your step. Seeing how effective quizzes are in four different industries should be enough of a foundation for you to get started with. Given the various successes these brands have experienced, it’s high time that you join their ranks. So don’t let quizzes fly under your radar any longer; try using them in your marketing strategy to see just how far your brand can get.